A yellow school bus pulling up to the street corner while still-drowsy, backpack-bearing children climb aboard. In my mind, there are few images that feel safer than that one. So I guess that is why news of an attack on parents or children while travelling to or home from school shocks me and feels somehow more evil than other equally evil acts of violence. Adorable 8-year-old Naama Margolese heartlessly cursed at and spat upon by extremists on the way to her Beit Shemesh school. Nachlaot boys and girls abducted and raped while walking the block from school bus to home by the evil Nachlaot pedophiles. 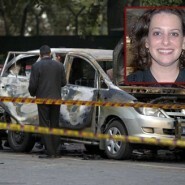 And yesterday, a new school pick-up victim: Tali Yehoshua Koren, an Israeli embassy employee injured by an Iranian bomb while on her way to pick up her children ages 7 and 13 from school in New Delhi, India. Channel 2 reported yesterday: “From her hospital bed, Tali told her husband that she noticed an explosive being thrown over the car, and then she heard a huge explosion. “Thank God that the kids weren’t with me,” she added. IY”H, may Tal bat Tsfira be blessed with a complete and speedy recovery so she can return home soon to her family.